I posted this last year in remembrance of my grand-uncle Les, who gave his life for his country during World War II. I am reposting it today as it is Remembrance Day here in Canada. May we never forget the sacrifice he and his fellow soldiers gave to our country. Private Leslie Gerald Lake, 4th Perth Regiment, circa 1940. Digital copy of photograph. Privately held by Kathryn Lake Hogan UE, [ADDRESS FOR PRIVATE USE,] Windsor, Ontario. 2004. Leslie Gerald Lake was born 18 March 1916 in Kirton Holme, Boston, Lincolnshire, England. He was the second youngest child of Herbert and Fanny (Crawford) Lake. Les immigrated to Canada with his family in 1926. The family eventually settled in London, Ontario. Les and his brother, Ray (my grandfather) enlisted in the army in St Mary's, Ontario. Ray was not accepted for overseas duty as he had curvature of the spine. Les served as a private in the 4th Perth Regiment. He was part of the Canadian Division who fought against the Germans in Ortona, Italy in December 1943 and January 1944. It was a horrible battle. Many men died or were wounded. It was the only battle in which the Perth Regiment did not succeed in its objective. Les was first reported wounded in The London Free Press. However, the next day the paper reported that he had actually died of shrapnel wounds. The London Free Press, "Wounds Fatal". London, Ontario, Canada, January 1944, page 4. Uncle Les died of shrapnel wounds on Thursday, January 20, 1944. He was 27 years old. He was not married and he had no children. He is buried in the Moro River Canadian War Cemetery in Ortona, Italy. The Commonwealth War Graves Commission, The Maple Leaf Legacy Project and Veterans Affairs Canada among others are all working hard to keep the memory alive of the men and women who served Canada to keep it "the true North, strong and free". 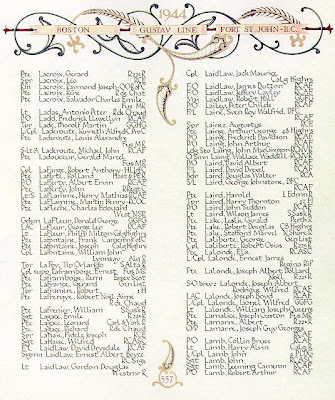 Digital image of page 357, The Books of Remembrance - Second World War, listing Pte. Leslie Gerald Lake, Perth Regiment. Last week I received an email from a secondary school teacher located in Woodstock, Ontario. Thirty of her students will be travelling to Italy next week. Each student has been paired with one Canadian soldier who was killed at the Battle of Ortona or during the Italian Campaign in World War II. One of these students is representing Private Leslie Gerald Lake. This student will be participating in a ceremony on November 25, 2008 in Ortona, Italy. Update: Uncle Les is not forgotten. Last year, I received a phone call from the teacher. She called to tell me that the trip was successful. Further, one of her students, a wonderful, young man named Nathan, had been chosen to lay the wreath during the Remembrance Day ceremony. He had been chosen to represent Uncle Les. I had the opportunity of briefly chatting on the telephone with Nathan about the trip. And, I was able to thank him on behalf of our family for visiting Uncle Les' grave.